We laughed so hard over how clever we thought we were with that little play on words that we just had to put it in the post. Seriously though, these breakfast meatballs are so tasty and make for the easiest breakfast. Just make a batch of these on Sunday and then you’ll have them ready for quickly re-heating in the morning the next few days. They are packed with flavor from the bacon and sausage and they bind together well with the shredded parsnip. 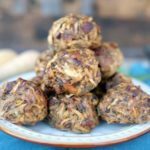 I eat them with spinach and sour kraut and find it to be great fuel for my mornings! Also, you just mix everything together in a bowl and then bake them for 40 minutes. Doesn’t get much easier than that! Just make a batch of these bacon and sausage breakfast meatballs on Sunday and you'll have them ready for re-heating in the morning the next few days. Over medium-high heat cook diced bacon pieces until they start to get crispy. Remove from heat and place on a paper towel covered plate to cool. Place sausage in a mixing bowl and set aside. If you are using a food processor, use the grating attachment. Put the onion, mushrooms and parsnip through the food processor. Otherwise, if you are doing it by hand, dice the onion and mushrooms and then grate the parsnip. Add onion, mushrooms and parsnip to the mixing bowl with the sausage. Add bacon pieces and sage also. Use your hands to combine all of the ingredients in your mixing bowl. Form the mixture into oversized golf ball sized balls and place them on the lined baking sheet. It should make roughly 18 meatballs. 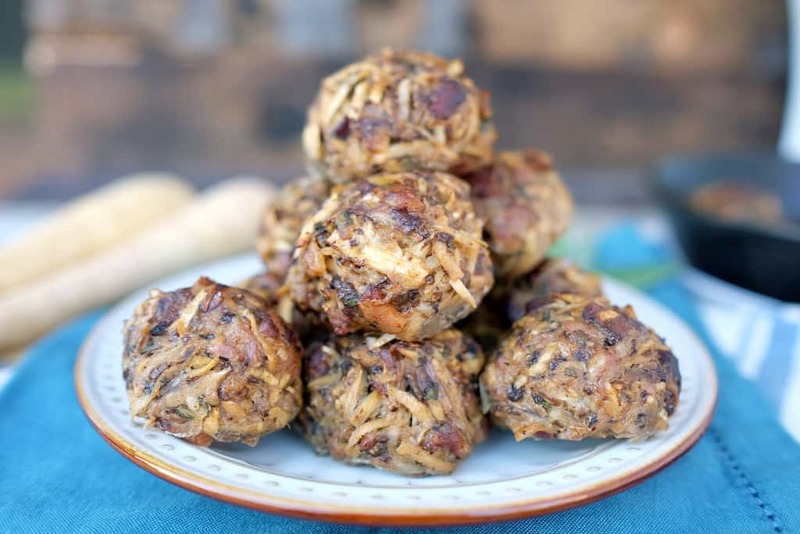 Enjoy these breakfast balls with spinach, kraut and blueberries, or with eggs and spinach. Yum! Haha meet balls for breakfast, yes please! Do you think I could share an image and link to this recipe for a roundup I’m doing? I would have loved this recipe so much, however I think the food processor ended up with the veggies being TOO processed which created a pulpy and foul smelling mess (I don’t normally cook with parsnips or mushrooms though). If I had grated or small diced them all, I think it would have turned out better. I would like to re-create it and do that next time! Did you use the grating attachment as noted in the recipe or the s-blade? You can definitely over-process the veggies with the s-blade so you have to be careful of that. Hopefully you can adjust and they turn out better next time.